Theatre throughout the ages has been an important tool in teaching valuable life lessons. 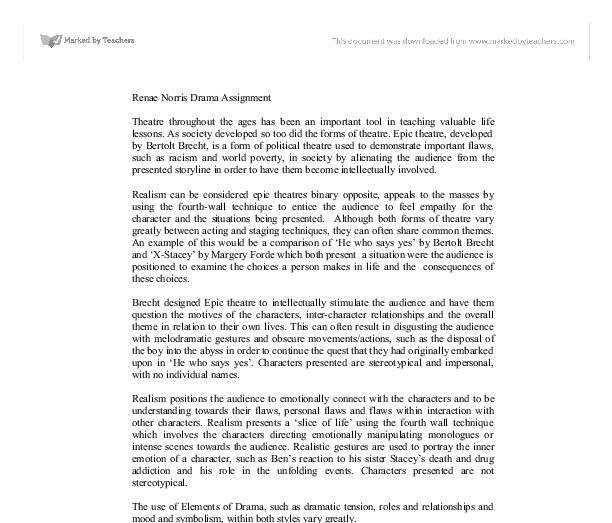 Renae Norris Drama Assignment Theatre throughout the ages has been an important tool in teaching valuable life lessons. As society developed so too did the forms of theatre. Epic theatre, developed by Bertolt Brecht, is a form of political theatre used to demonstrate important flaws, such as racism and world poverty, in society by alienating the audience from the presented storyline in order to have them become intellectually involved. Realism can be considered epic theatres binary opposite, appeals to the masses by using the fourth-wall technique to entice the audience to feel empathy for the character and the situations being presented. Although both forms of theatre vary greatly between acting and staging techniques, they can often share common themes. An example of this would be a comparison of 'He who says yes' by Bertolt Brecht and 'X-Stacey' by Margery Forde which both present a situation were the audience is positioned to examine the choices a person makes in life and the consequences of these choices. ...read more. Characters presented are not stereotypical. The use of Elements of Drama, such as dramatic tension, roles and relationships and mood and symbolism, within both styles vary greatly. Brecht's 'He who says Yes' present's stereotypical characters that have little emotion, if any, emotion. These characters often make a humorous statement about society in a clinical manner. 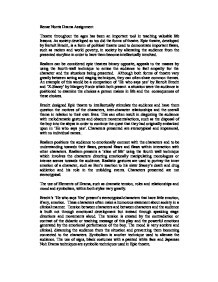 Tension between characters and between characters and the audience is built not through emotional development but instead through speaking stage directions and movements aloud. The tension is created by the contradiction or contrast of the didactic or teaching message of this play and the powerful emotions generated by the emotional performance of the boy. The mood is very sombre and clinical, distancing the audience from the situation and preventing them becoming connected to the characters. Symbolism is another technique used to alienate the audience. The use of signs, black costumes with a painted white face and Japanese Noh Drama techniques are symbolic techniques used in Epic theatre. ...read more. Although this aim is desired, Epic theatre is political theatre and only appeals to those who are politically inclined. Audiences often leave disgusted at the clinical and often intellectual symbolism used to convey the issue. Action is defiantly not aroused as the audience are too alienated to comprehend the motives behind character interactions and the only decision the audience is most likely to be left to make is wether or not to walk out of the theatre in sheer disgust or boredom. Whereas Sue Rider quotes that realism is "theatre that takes questions and issues of real concern and treats them with respect". Drug abuse is a pressing issue in modern society. 'X-Stacey' addresses this issue and presents a realistic representation of drug addiction which connects with the audience and victims of addiction. Whether Epic or Realistic theatre, both plays deal with the issue of a person's ability to make choices and accept the consequences and/or the responsibilities bestowed upon them by society in direct relation to the choices made. ...read more. Some of the things that were used to alienate that audience was that Brecht used to refer to his actors as 'demonstrators', and he believed that they should stand beside that character, not get into the character. The actor's and actresses should behave as though they know they are being watched, "He expresses his awareness of being watched. When walking he appeared to glide, not in an elegant way but in a smooth casual way, as were most of his other movements. He was always very laidback and unhurried in everything he did, which as well as giving him a calm air about him made him seem quite dumb. He also conveys the extremes that Ui is prepared to go to; to obtain the power he wishes to gain. be lying, showing that he doesn't believe in what the oath contains. The entrance of Rich is important; before Rich worked in office, he was innocent, and a friend of More's. Now, as More warned him, he has become corrupt since he has been in office: "e is now splendidly official." And it is that wondering which leads us to the analogy of the Spanish people themselves. Garc�a M�rquez is trying to suggest that our confusion over the galleon is exactly the confusion of the Columbian natives over the arrival of the Europeans in their land. Where did they come from?